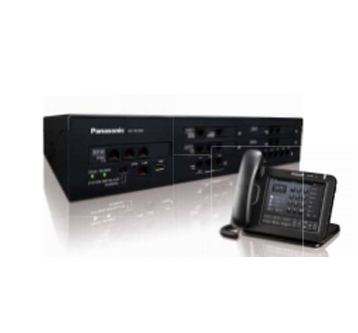 The Panasonic KX-NS1000 is a SIP based Unified Communications and Collaboration server, designed to improve customers’ business efficiency through Voice over IP and wireless technologies. IP networking and SIP are fully supported, while maintaining backwards compatibility with traditional ISDN trunking to ensure flexibility. The NS1000 is built on SIP and IP technologies, with powerful built-in Unified Collaboration and Communication components including desktop tools, voice messaging and an interactive voice response system. Partnering with a comprehensive range of terminals, accessories and applications software ensures that systems can adapt to meet all the communication requirements of your business to support revenue growth. With best in class, high definition voice quality and on-demand capacity enhancements, the NS1000 is the core of a powerful VoIP communications solution offering flexibility, simplicity and productivity. Direct support for up to 1,000 users in a full transparent network and for integrated Q-SIG networks for up to 8,000 users. A powerful Computer Telephony Interface allows the NS1000 to work with many CRM tools, maximizing access to hard-earned customer contact data. One-look Networking is a system where a single KX-NS1000 operates and provides PBX features even though two or more main units are networked. It is not necessary to provide additional servers. The system can be expanded easily via a web based maintenance console. One-look Networking provides a maximum of 16 sites with the large capacity of KX-NS1000. The NS1000 is a fully network aware server, with a variety of options for single and multi site expansion. Units can be combined to scale up to 1,000 direct users with full transparency for both users and administrators. (up to 8,000 users across a QSIG network). With the NS1000 system, customers can manage stand-alone and networked systems connected via an IP network from any location. The system supports both SIP and H.323 based inter-networking in addition to the traditional ISDN QSIG connectivity. For multi-site organizations, this brings the benefit of lower cost branch-to-branch communication, either by leveraging existing corporate IP Wide-Area-Networks (WANs), or using Managed VPN services from network service providers. Create virtual teams across multiple networked sites and share resources more efficiently, through key enhancements in features such as Call Distribution, Centralized messaging, Conferencing and Mobile Integration. Based on IP networking technologies, the NS1000 combines advanced telephony features with a scalable framework of applications that have been carefully chosen and optimized for a variety of business types, whether based on a single site or distributed globally. The NS1000 makes communications simple for office workers as well as mobile, remote and home based staff, in environments as diverse as call centers and distribution centers. Built on open technologies, the NS1000 is developer friendly, offering CSTA, TAPI, and multiplexing interfaces, with SIP communications, producing an open development environment which encourages 3rd party applications development to further enhance capabilities. This ultimately minimizes the additional investment of new software applications. In most cases your available application can be integrated with the NS1000. The NS1000 gives users great flexibility for managing messaging services. Voice and fax messages can be received using the built in Unified Messaging system in a number of ways – as email attachments, through the NS1000 IMAP4 server, or using the Communication Assistant Outlook Toolbar. This means users can listen to voice messages using their phone or PC, for maximum flexibility. Computer meets telephone: the Panasonic Communication Assistant productivity suite is a highly intuitive Unified Communications and collaboration (UCC) software solution for Microsoft Windows™, that brings together many features. Simple ‘point and click’ telephony, presence, availability, MS Outlook integration, visual voice messaging, CRM database integration and much more are combined in a single application – enhancing and simplifying communications for business telephony users. By connecting existing Panasonic PBX systems with the KX-NS1000, you can efficiently obtain expandability and flexibility for legacy lines and terminals and add IP capacity and functionality at a low cost. -By connecting the KX-NS1000 to an existing Panasonic PBX*1, you can expand IP lines and terminals and utilize the Unified Messaging features of the KX-NS1000*2. This is also recommended for KX-NS1000 users that want to use legacy terminals and trunks for flexible system expansion. 1 An existing PBX refers to a Panasonic KX-TDE series, KX-NCP series, or KX-TDA100/200/600/620. 2 You can connect a maximum of 2 existing PBXs for one KX-NS1000. A maximum of 8 existing PBXs can be connected for the entire One-look Network. The KX-NS1000 gives you great flexibility for managing messaging services. Voice and fax messages can be received using the built-in Unified Messaging system in a number of ways; as e-mail attachments, through the KX-NS1000 IMAP4 server, or using the Communication Assistant. This means you can listen to voice messages using a phone or PC, for maximum flexibility. The KX-NS1000’s built-in voice mail can handle incoming calls, record messages and conversations, and manage mailboxes all from a cellular phone. Two channel two hour voice storage is preinstalled. With activation keys the number of channels can be expanded to 24 and the recording time can be expanded to 15 hours. The recording time can be further expanded to a maximum of 1000 hours by changing the storage memory. Voice mail resources can also be shared across the network (using One-look Networking). The KX-NS1000 includes an advanced call routing function for small to medium size call centers. This function can be used without an external CTI server. More efficient call reception enables you to effectively utilize limited resources to assist in improving customer service. Furthermore, the solutions can be expanded to suit more sophisticated call centers in combination with Voice Mail functions, the Communication Assistant and third party CTI applications. The Panasonic KX-NS300 Smart Hybrid PBX is a cost effective legacy and IP communication system for small and medium sized companies that can be flexibly configured and expanded according to the your needs. The KX-NS300 has advanced features and starts from 6 analogue trunks and 18 extensions, up to 192 extensions with an Expansion Unit. KX-NS300 is also a unified communication system which has rich IP features such as mobile linking, integrated voice mail and e-mail, instant messaging (chat), and presence information. It can also use built-in applications such as a call centre solution, mobile solution, and voice mail system to provide more efficient work and increased customer satisfaction. KX-NS300 can utilize the benefits of a hybrid system to help businesses lower costs and allow a quick return on investment. By connecting the KX-NS300 units in different offices with an IP network, you can construct a network that integrates both voice and data. This enables extension calls between offices over the IP network, and reduces costs. The KX-NS300 can utilize an IP network to use IP phones as head offi ce extensions, without installing extra KX-NS300 units or special routers at remote sites. In other words, migration to an IP network enables installation costs to be saved. By using IP phones as extensions, you don’t need to change the settings at the PBX each time you change your office layout, as is normally required. Simply move the phone, and then connect it to the LAN for quick and easy use. Existing DPTs, APTs and SLTs from Panasonic can continue to be used, enabling a system to be replaced at a low cost without wasting resources. Improving customer satisfaction is the key to succeeding in business. The KX-NS300 provides services for smoothly responding and following up on customer queries. The KX-NS300 can be expanded to a voice mail system that can record a maximum of 24 channels and 400 hours. KX-NS300 also sends e-mail to notify you when you have new voice messages. The messages can also be received as attachment fi les and forwarded. E-mail notification can also be sent for missed calls where the customer did not leave a message, enabling you to quickly contact the customer. 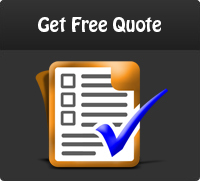 Recent business requires customers to be contacted anywhere and anytime. As long as the KX-NS300 is in an environment that can connect to the internet, it can enable IP phones to be used as extensions for easily contacting people. If you have Internet connection, KX-NS300 enables you to easily install IP phones in locations distant from the office, such as the homes of teleworkers, mobile workers using softphones on smartphones. Connecting with IP networking enables IP phones* to be used as KX-NS300 extensions, without the need for any routers or extra devices. Softphones on smartphones used by mobile workers can be installed as KX-NS300 extensions, meaning they will not miss calls as long as they are in a Wi-Fi/3G/LTE environment, whether they are at the office or away. IP phones such as a desk phone or softphone can be paired to use a single number. This enables customers to easily contact staff with a single number, regardless of whether they are inside or outside the office. The KX-NS300 includes an advanced call routing function for small to medium size call centres. This function can be used without an external CTI server. More efficient call reception enables you to effectively utilize limited resources to assist in improving work efficiency. The caller can recognize their position in the queue through voice guidance. They can then decide whether to stay in the queue or leave a message and hang up, according to the situation. The KX-NS300 can be used to automatically record conversations with customers. Supervisors can listen to the recorded voice data, and the voice data can be automatically saved to USB memory or an external server via the internet. The data can be used to understand problems or opportunities relating to customer service. The supervisor can monitor the live status of callers, agents, and grouped members, to understand on-site problems and improve their call centre. Reports can also be used to understand problems or opportunities relating to customer service, and recorded call data can be backed up and restores via the network as necessary. Flexible communication methods are essential in current business situations. Communication Assistant (CA) from Panasonic and its applications provide you with the communication methods to meet your needs. CA is a highly intuitive PC-based application suite with powerful point and click telephony and screen-based presence, availability, and a variety of collaboration tools. It can be used with or without a server. When Microsoft Exchange Server is integrated with CA Client, your presence will automatically change according to the contents of your Exchange calendar. You can link with CA and Panasonic partner’s applications to provide various solutions. The KX-HTS824 enables a flexible system that freely combines both IP and legacy systems to cost-effectively respond to your needs. Also, the KX-HTS824 brings you a solution as a SIP Trunk adapter for existing PBX systems. You can connect KX-HTS824 to an existing system to adopt SIP Trunk services. You can also enjoy the features of new Panasonic IP terminals, KX-HDV series IP phones (including video phones) and KX-NTV series (IP doorphone and IP camera). The necessary standard call handling functions, such as CID (Caller ID), DISA (Automatic Call Routing), and AA (Auto Attendant)/VM (Voice Mail), are all built-in. Furthermore, a capacity for 6 SIP trunks and 24 SIP extensions is built-in, so there is no need to buy external devices when using the IP function. An analogue capacity of 4 trunks and 8 extensions is also built-in, which can be maximized to 8 trunks and 24 extensions with optional cards. In addition to that, a router and Wi-Fi access point is built-in enabling you to use the KX-HTS824 as a Wi-Fi access point for PCs or smartphones. This system also has a quick phone conference feature as a built-in function. Users simply need to dial assigned meeting room extension number and input PIN number for joining the phone conference. 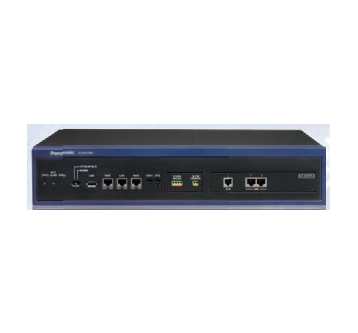 The Panasonic KX-HDV430 can be easily installed in your branch or home office (Media Relay Gateway function) and video communication is possible without a VPN. There is no need to go on a business trip for a meeting. Also, it can be linked with the KX-NTV series (IP doorphone and IP camera), allowing it to be used as a simple monitoring system. Smartphones with software phone functionality used by mobile workers can be installed as KX-HTS824 extensions, meaning they will not miss calls as long as they are in a Wi-Fi/3G/LTE environment whether they are at the office or away. Furthermore, complicated and expensive VPN services are not needed to use this function. 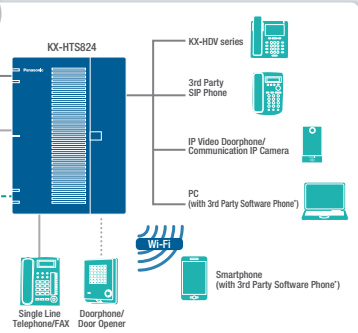 The phone can be used right away without any extra settings, as the internal/external line settings are automatically set by connecting a terminal to the KX-HTS824. Wi-Fi connection with PCs and smartphones can be easily done using the Wi-Fi setup button. Also, WEB programming is possible with the KX-HTS824. The GUI of the Web Console is really simple allowing for easy setup and maintenance. Secure Web Programming from outside is also available by using HTTPS.